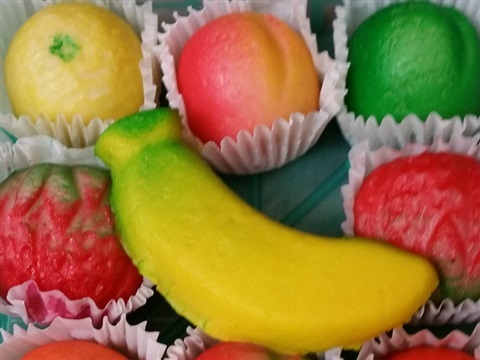 You can make your own marzipan. On my way out of the store I stopped to get a drink. I adore that lingonberry soda they have. I also did some Easter shopping. There were some sweet paper mache eggs to fill with candy, Swedish chocolates, as well as Daim, which is a delicious crunchy toffee covered with chocolate. 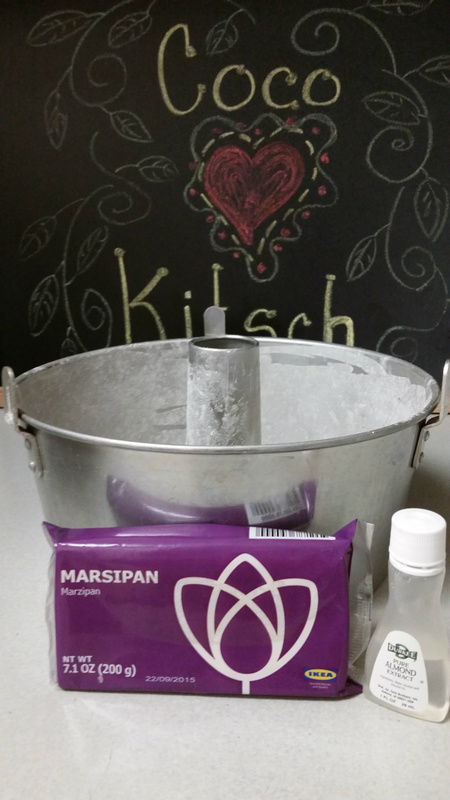 Nestled among these confections I noticed a purple-wrapped rectangular mass labeled "Marzipan." I got a couple of packages, slurped my soda, and left with my prizes. Once home, after coaxing the dogs through the tunnel several times, I emptied my Ikea bag and stared at the two bricks of Marzipan. I opened one, cut a slice from the slightly brownish, play-dough like mound, and was pleasantly surprised. The texture was like the inside of a Jr. Mint and it tasted of sweet almonds. It made me want to eat more. My previous experiences with this substance was small to nill. I knew that you could get little fruits made out of it, but had never seen it in this raw state. A little research later, I am ready to quickly expound on the virtues, history, and uses of Marzipan. I also want to state for the record that I did, in fact, stop eating it after that first couple of tastes... even though that 17 oz bar was gone after a couple of days! 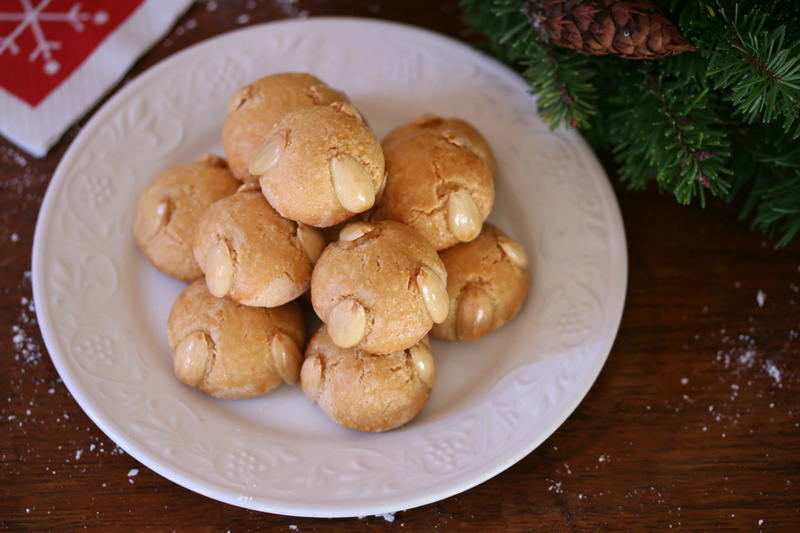 One of the first things I noticed after reading comments on the Marzipan recipe pages was that lots of people seem to make this stuff just to eat, not necessarily to make into candy or use in baked goods. 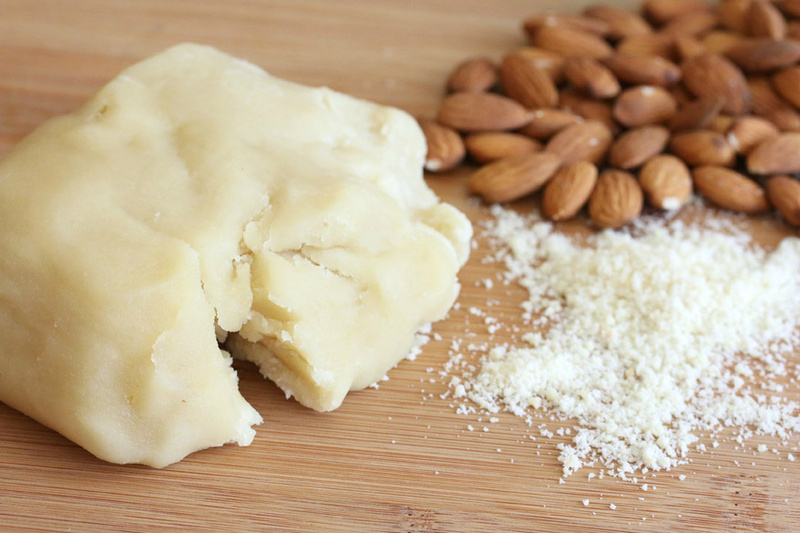 Today, Marzipan is made from almonds or almond paste, almond extract, powdered sugar, rose water, and corn syrup or egg white. Historically, according to Wikipedia and German Pulse, it consisted primarily of sugar or honey and almond meal augmented with almond oil. It is and was made into sweets that are chocolate-covered or formed to look like fruits, vegetables, and other shapes. It is also rolled into thin sheets and used for icing cakes or for layers inside cakes such as fruitcake in the UK. It is baked into Stollen and tarts and some versions of King Cake for Carnival. It is traditionally used at Christmas and Easter in Western Europe. 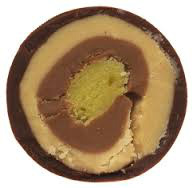 Versions of Marzipan are made all over the world. It dates back to 1800 BC in ancient Egypt and earlier in Persia, and was thought to have been brought to Europe by returning crusaders in the 13th century. At that time sugar was expensive and so Marzipan was typically found only at the tables of affluent, noble, or royal families. In the early 1800's the price of Marzipan dropped due to the industrialization of sugar production from sugar beets. Everybody got to eat it! In 1806, taking advantage of the changing availability of sugar, Johann Georg Niederegger took over a confectioner's shop in Lubeck Germany and started making Marzipan for the masses, Today, Lubeck is world famous for its Marzipan. 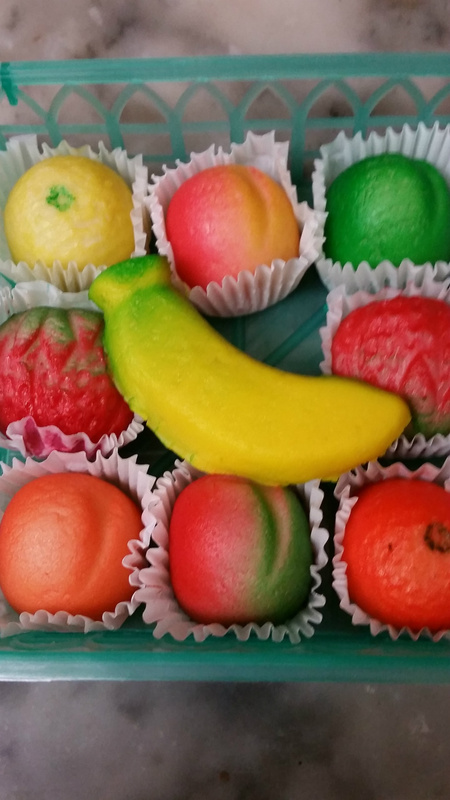 Marzipan fruits. They are pretty, but I would rather eat fresh, soft homemade Marzipan. 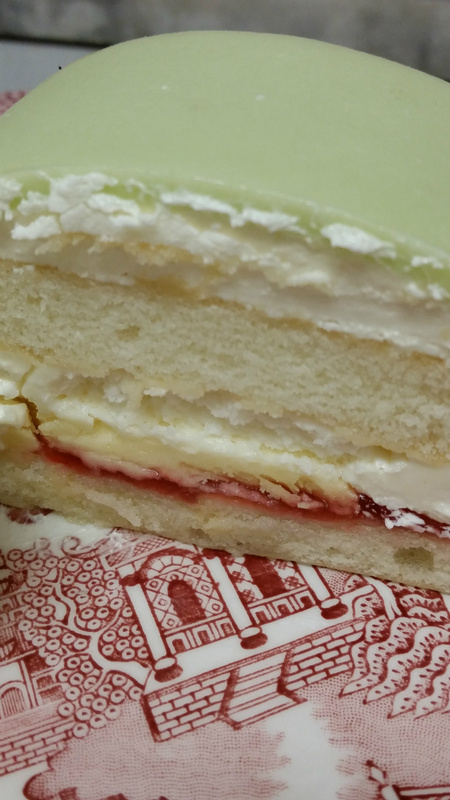 Why is it called "Princess Cake?" Princess cakes in the Gelsens bakery. 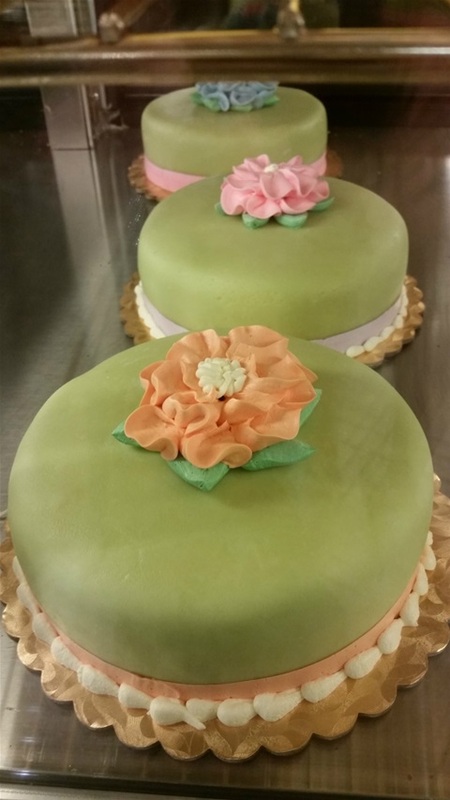 These traditional Swedish cakes are covered with a thin green layer of Marzipan. 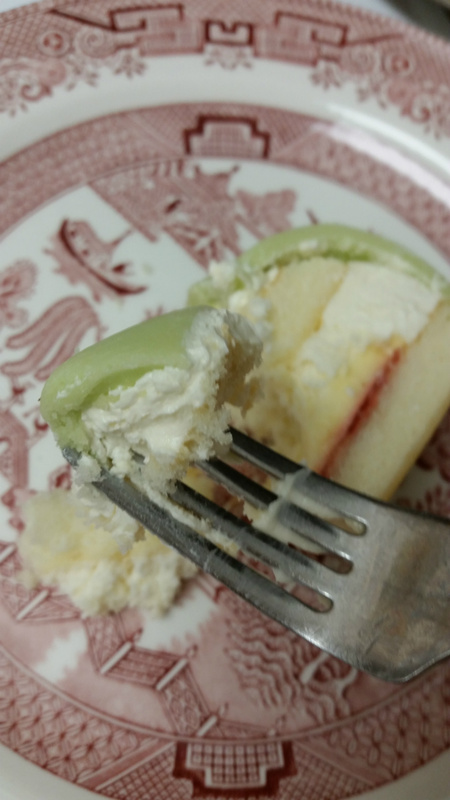 Before giving you some recipes to make and use Marzipan, I must discuss Princess Cake with you! I unwittingly got a couple slices of this amazing cake at the Gelsens bakery and kind of fell in love with it. The Marzipan covering on the cake is thick, almondy and sweet. The inside is alternating layers of sponge cake, pastry cream, whipped cream, and in some versions, a thin layer of berry preserves. 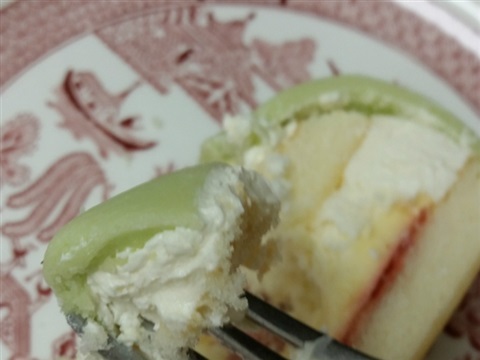 Princess Cake first appeared in the 1930's in a cookbook named Prinsessornas Kokbok It was originally called "gron tarta" (green cake), but was given the name "Princess Cake" because three princessess, the daughters of H.R.H. Prince Carl, Duke of Vastergotland, who were taught by a woman who published the first cookbook with the recipe in it, were especially fond of it. If you ever come across it in a bakery, I recommend you try it! 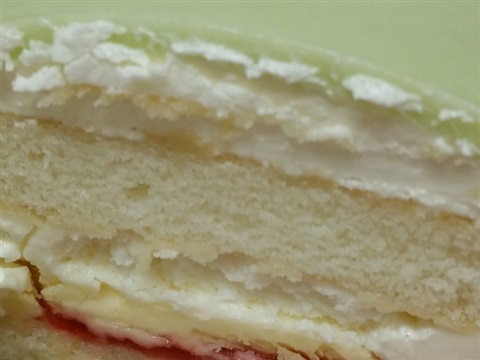 A slice of Princess Cake showing the layers. Who knew pastry cream was so good? 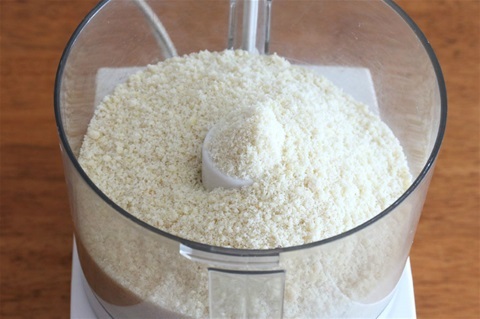 Almond meal is mixed with powdered sugar. Let me begin by saying that I did not make my own Marzipan. 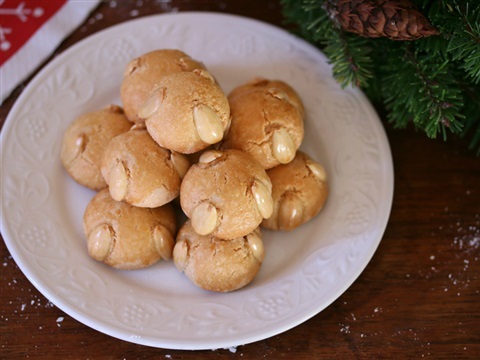 There are many recipes online, and some use almond paste. I chose the recipe from www.daringgourmet.com because it uses almond meal flour instead of paste. Bob's Red Mill, headquartered in Milwaukee, OR, makes almond meal flour which is made from blanched almonds with the skins removed. You can order it from Bob's or perhaps pick it up at a local gourmet, co-op or healthfood store.This recipe also requires food-grade rose water, which can be found at any Middle Eastern market. This recipe makes 12 oz. Place the almond flour and powdered sugar in a food processor and pulse until combined and lumps are broken up. Add the almond extract and rose water and pulse to combine. Add the egg white and process until a thick dough is formed. If it is too wet, add more powdered sugar and almond flour. It will become firmer after it's been refrigerated. Turn the marzipan out onto a work surface and knead it a few times. Form it into a log, wrap it up in plastic wrap and refrigerate. Marzipan will keep for at least a month in the fridge or up to 6 months in the freeezer. Also, some people are concerned about using uncooked egg whites. Keep in mind that they are pasteurized or you can us pasteurized egg whites in the carton. They are preferable to using corn syrup. Now that you've got Marzipan... make a cake with it! This "Easy Almond Cake" from Nigella Lawson is a moist pound cake with the Marzipan baked-in. According to Nigella Lawson, cooking with Marzipan is making a comeback in Europe. I was looking for an easy recipe in which to use my 12 oz of Marzipan to see what it would taste like when baked. After converting the grams to cups, I made this delicious, moist cake in my vintage angelfood cake pan. I added lemon extract to the cake. 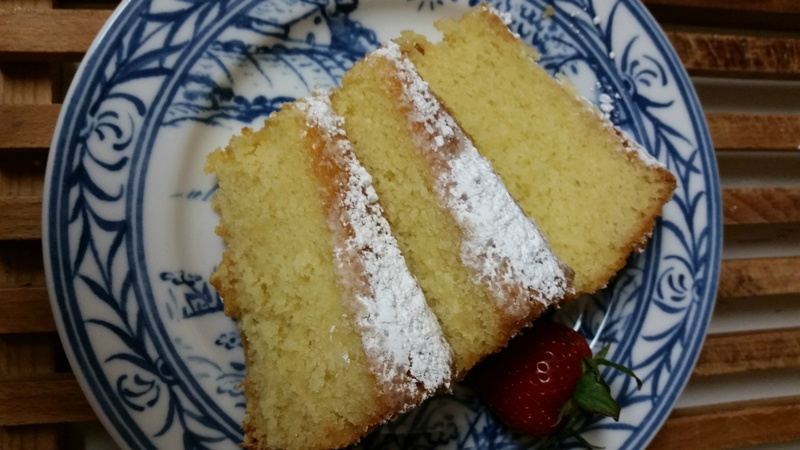 This cake could be used as a sponge or poundcake and served with fruit, custard, creme, or just eaten alone with a dusting of powdered sugar. It would be yummy cut into squares and put into a trifle. I will definitely make it again. Nigella's recipe calls for self-rising flour, which I do not use, so I added 3/4 teaspoon of salt and 3 teaspoons of baking powder to the recipe so the cake would rise. You will need a bundt or springform angelfood cake pan, greased and floured. Preheat oven to 325F. I mixed this cake entirely in my stand mixer. 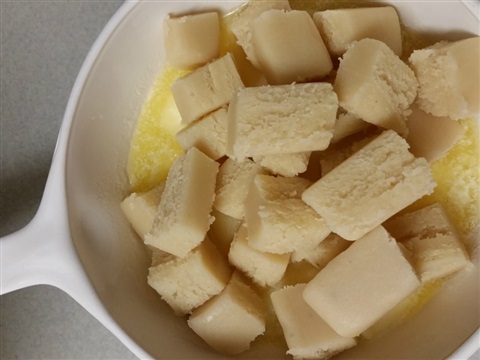 Cream the butter and marzipan with the sugar in your mixer. Mix until combined and smooth. 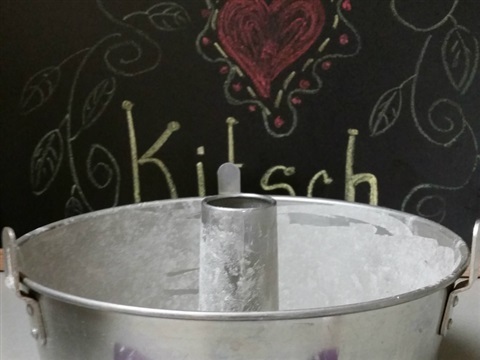 Add almond extract and vanilla or citrus flavor and mix. Add the eggs one at a time while mixing. Add the baking powder and salt to the flour and beat into the creamed mixture. Batter should be smooth and creamy. Pour into the prepared cake pan and bake for 50 minutes, checking from 40 minutes on. It should be lightly golden in color and a knife comes out clean from the center to be done. Remove cake from oven to cool. Do not turn cake out of pan until completely cooled. Sift powdered sugar over cake before serving. 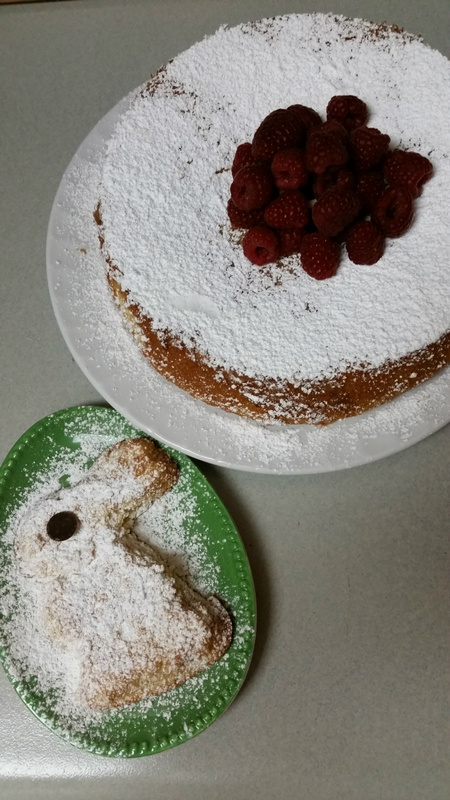 Ikea Marzipan and my mom's vintage angelfood cake pan! Be sure to grease and flour the pan when making this cake or you will be sorry when it comes time to turn it out. Click on each picture to see full view. 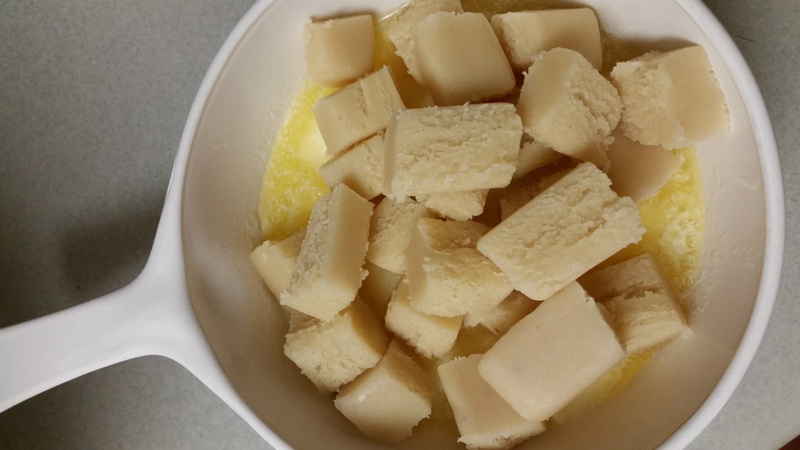 I melted the butter and let it cool before mixing it with the warm, cubed Marzipan in the mixer. 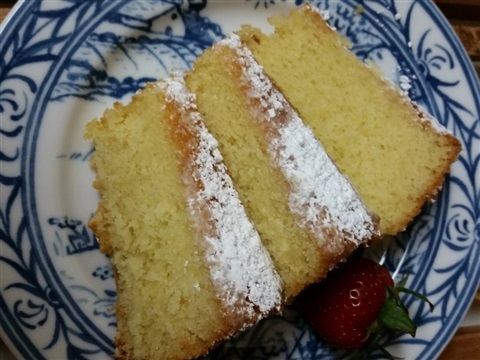 The Marzipan adds to the flavor and texture of this cake.